Why do we call these days the "Dog Days?" These canicular days get their name from the Dog Star, Sirius, the brightest star in the constellation Canis Major. At this time of the year Sirius disappears into the Sun's glow. Both heavenly bodies are in conjunction, rising and setting at around the same time. Ancient stargazers thought that the heat from Sirius, the brightest star in the heavens, combined with the heat of the Sun produced the hottest weather of the year! Even though Sirius is hotter than our Sun it is much too far away to warm our planet. The ancient Egyptians saw Sirius as a giver of life for it always reappeared at the time of the annual flooding of the Nile. When the star sank in the west and disappeared from the night sky, it remained hidden for 70 days before emerging in the east in the morning. This was viewed as a time of death and rebirth. The Egyptians copied this period in their funeral ceremonies. When a king died, his body was mummified, then interred in a pyramid or other tomb. By custom, burial took place 70 days after death, when the king was "reborn" in the stars. Culled from the radio scripts of Damond Benningfield. The Dog Star, Sirius is also known as our Spiritual Sun, esoterically the cosmic heart of our physical Sun. During the Dog Days when Sirius disappears into the Sun's glowing light, it could be said that our physical Sun is embracing our Spiritual Sun! After such a celestial union a rebirth or resurrection can be expected. 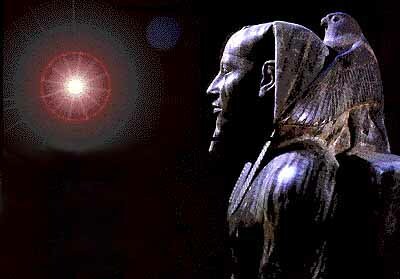 It is said that all great Avatars and evolutionary energies originate from Sirius, the brightest star in our heavens. Today the Sirius / Leo Festival, celebrated globally at the time of the Full Moon during Leo (July 22-Aug. 22), offers a great and unique opportunity to make contact with Sirian force. In celebration of our evolutionary link to Sirius and in preparation for becoming the Shining Ones on Earth, I offer this excerpt from the Invocation of Osiris. I am He who is clothed with the body of flesh yet in whom flames the spirit of the eternal Gods. I am the Lord of Life. I am triumphant over Death, and whosoever partaketh with me shall with me arise. I am the manifester in Matter of Those whose abode is the Invisible. I am the purified. I stand upon the Universe. I am it's Reconciler with the eternal Gods. I am the Perfector of Matter, and without me the Universe is not. In 2018 in the Pacific Time Zone, Sirius rises before the Sun on the last day of July, but remains hidden in its glare. When Sirius rises above the Sun at an altitude of 7 degrees it can be seen. This heliacal rising of Sirius occurs August 8, 2018 in San Francisco. The heliacal setting of Sirius (last visible setting of Sirius) in San Francisco occurred May 22, 2018 hence, Sirius is hidden from view for 77 days in San Francisco during 2018. On the first day of Sirius' reappearance the ancient Egyptians expected an abundant harvest, if the star appeared bright and clear. If Sirius appeared dull and red, a poor harvest would result. What color will Sirius be at its reappearance this year? When will you first see Sirius in the morning sky? Let me know! The first day of the 13 Moon Calendar, the New Year, begins on July 26. This date originally correlated to the heliacal rising of Sirius at 19.5 latitude north. Note: Sirius, The New Year Star, is at its highest overhead at midnight December 31, while Vega is located directly opposite, below the horizon, under our feet! BTW: As Sirius rises in the east, Vega is setting in the west. Mayan and Galactic calendar is July 25.
day for ritual, meditation and prayer. 2013-2020 of Opening the Seven Light Gates. This Day out of Time we open the Sixth Light Gate! reality ... of the harmony that unites all things." “Yellow Seed is the ordered pattern of growth. power of your intention or seed thoughts." Background ~ Jose Arguelles, Ph.D.
Sirius is the brightest star in the night sky. Intrinsically, Sirius is over 20 times brighter than our Sun and over twice as massive. As Sirius is 8.7 light years distant, it is not the closest star system — the Alpha Centauri system holds this distinction. Sirius is called the Dog Star because of its prominence in the constellation of Canis Majoris (Big Dog). In 1862, Sirius was discovered to be a binary star system with a companion star, Sirius B, 10,000 times dimmer than the bright primary, Sirius A. Sirius B was the first white dwarf star discovered, a type of star first understood by Subrahmanyan Chandrasekhar in 1930. While studying Sirius in 1718, Edmond Halley discovered that stars move with respect to each other. The Sirius system is shown above captured in X-ray light.